Oregon is known for rain, even when most of the state is relatively dry. The most populated area – the valley where we reside – gets loads of misty, hazy days. 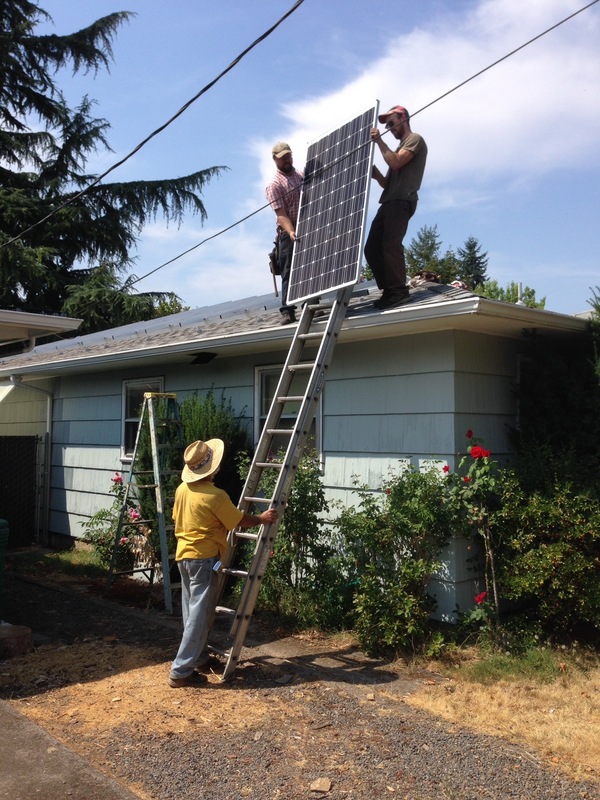 For this reason, I never thought putting up solar panels would be cost effective. My husband has been eager to do something creative for several years, even drawing out a unique design for a horizontal residential windmill that would be aesthetically pleasing and not shake the entire house to its foundation. I admit that I was relieved when his attention turned from wind to solar. 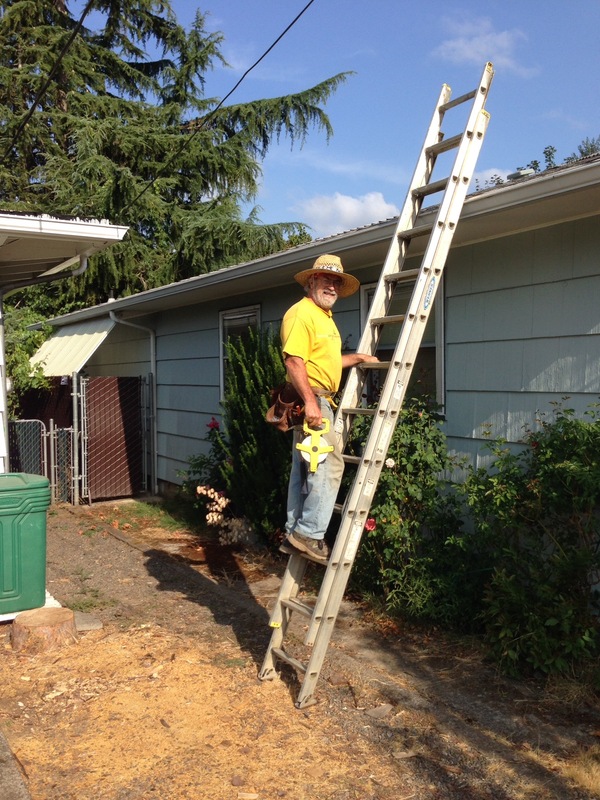 After doing our due diligence in research, we hired a wonderful local contractor. Paul Solonika, recommended by a friend, put us at ease from our first meeting. He walked us through the entire procedure and coordinated with the electrical team as well as required inspections. Many of the steps were behind the scenes: light metering, getting paperwork through different channels, ordering material. It became real the day the panels arrived. Paul’s company “Paul Solonika and Sons, LLC” is just that. Paul and his two sons. 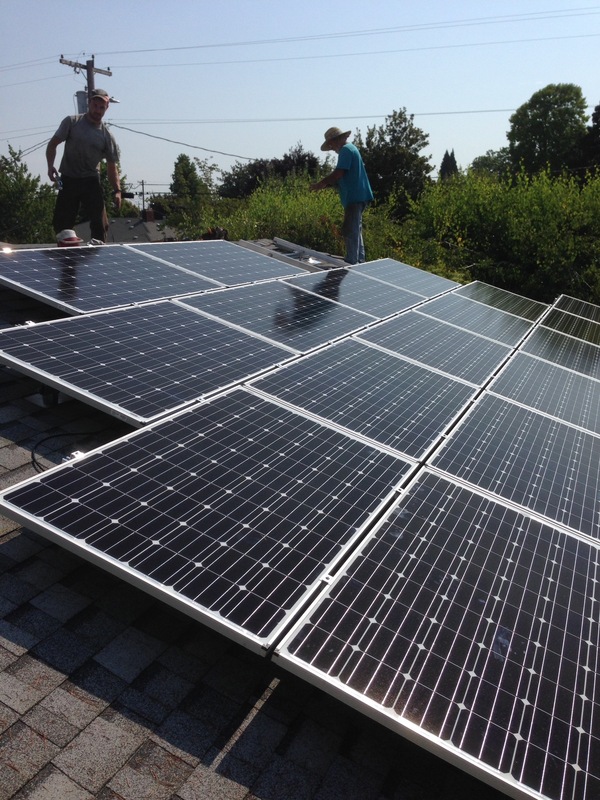 They showed up one bright morning with panels, ready to work. There was a great deal of hammering as the framework was prepared. We are only paneling the south side of the roof. Sadly, the electrical box and meters are on the north side. There was a great deal of crawling through the attic. Finally (I say finally, but it was still the first day) the first panel was hoisted. Inside the house, I did my happy dance. Paul coordinated with the electrical company who was also there on time and prepared. We found this pattern comforting. Everything happened in a seamless dance of workers and inspectors coming and going in order. Paul and his two sons worked hard. He is proud of them and finds joy in being able to work as a well coordinated team. Each son adds a skill set to the mix. The fancy solar box is added to display how everything is working. Drum roll…..the panels are turned on and we wait for the sun to make the first indication that all is well. 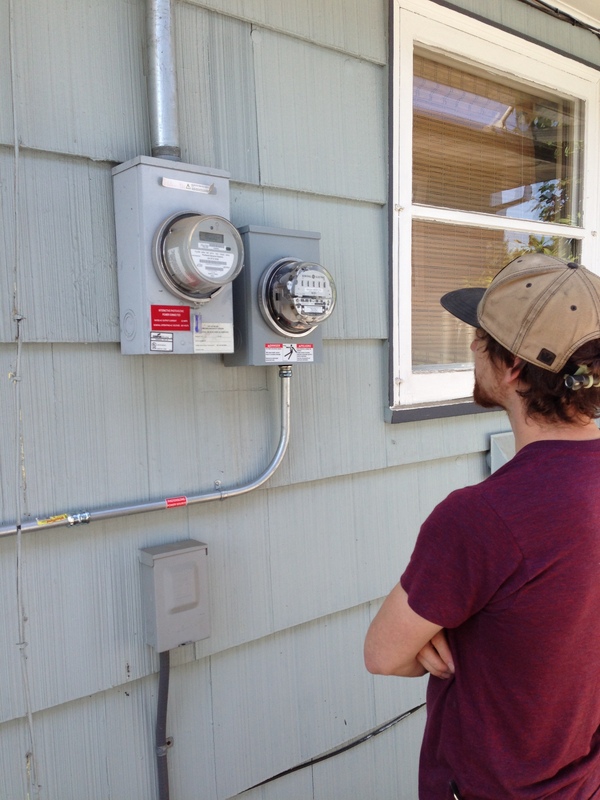 The Portland General Electric meter is to the left, while the solar meter is to the right. Success. 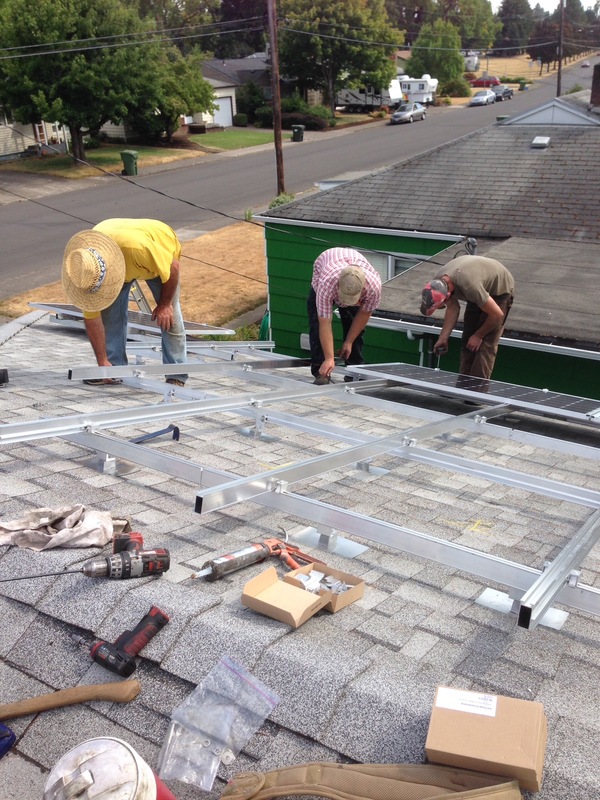 Sadly, we had to turn off the array until we passed the structural and electrical inspections. Then another visit from PGE. 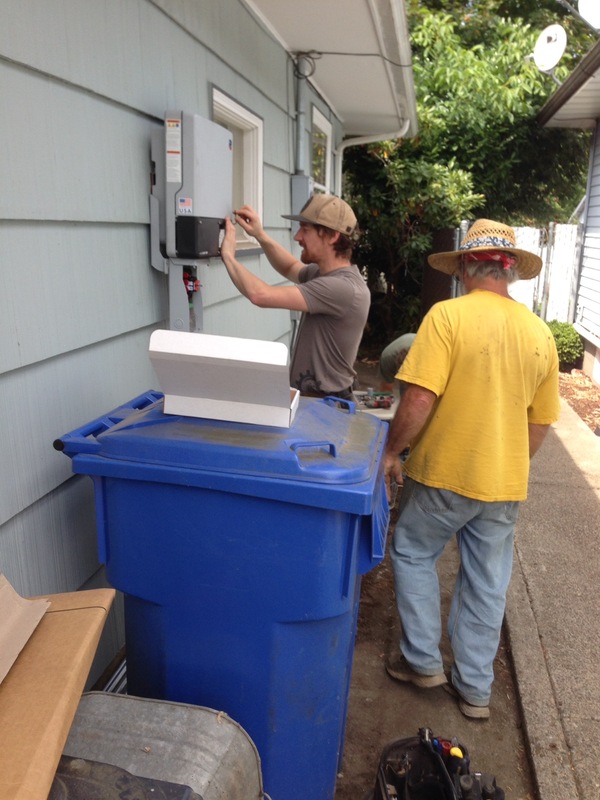 To make it all official, one last visit from the Energy Trust of Oregon. Finally our solar array could be turned on. Ta-da! Bring it on, sunshine. Bring it on. *A special shout out to Paul Solonika and Sons, LLC for making a complex process orderly and being with us every step of the way.